Spring can get really busy with the weather warming up! Slow cooker meals come to the rescue during this time of year and these Chinese Pork Chops have become our new favorite! 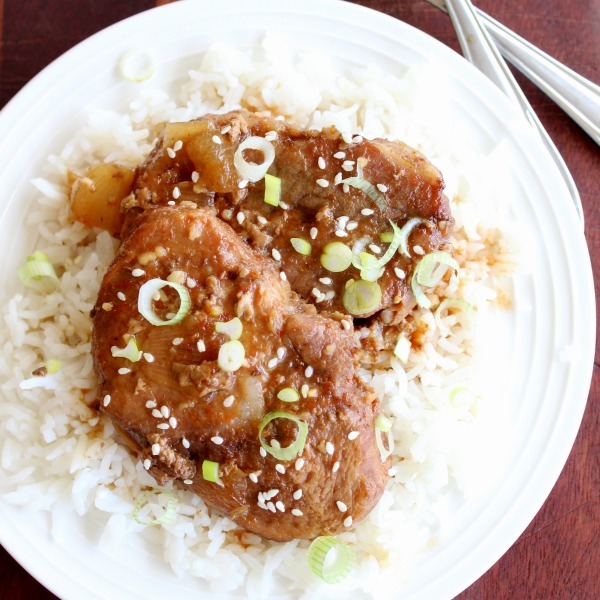 We love these Slow Cooker Chinese Pork Chops! Spray slow cooker with non-stick cooking spray and add pork chops to the bottom of the slow cooker. Top pork chops with onions. In a medium-sized bowl, mix together ketchup, brown sugar, soy sauce, water, garlic, and ginger and pour over pork chops. Cook on low heat for 3-4 hours or until meat is fall-apart tender. Serve over warm rice and top pork chops with sesame seeds and sliced green onions (optional). These chops sound so good. Thank you. I just made these tonight. They were great. Everyone enjoyed them including the 19 month and 7 year old. Thanks.